GREAT SALT LAKE — Dave Shearer sees the evidence of water levels dropping in the Great Salt Lake every time a boat has to be taken out of its slip at the Great Salt Lake Marina. Lately, it's been a common occurrence. "This year, we're now looking at near-record lows, " said Shearer, the marina's harbor master. "We're probably going to lose about 30 boats this year. Over the course of this drought, whether it's economic reasons or water level reasons, we'll be down about 100 boats from what we were at the height of the late 1990s." The lake is currently about 2.5 feet above its all-time recorded low in 1963 — an elevation of 4, 194 feet — and the evaporation season is not over yet, according to Jim Davis, a geologist with the Utah Geological Survey. "It's possible we could lose another foot this season, " Davis said. "With the right weather conditions, we might even hit that 1963 record next year. I don't think it's particularly likely, but if the trend keeps continuing in the 21st century, it's probably just a matter of a few years before we hit that record." About 95 percent of the water that enters the lake comes from direct precipitation, with the Jordan, Weber and Bear rivers as major contributors, according to Davis. Dry conditions in recent years have caused water levels in reservoirs upriver from the lake, as well as water tables underground, to drop. 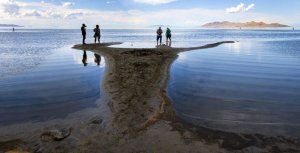 While the Wasatch mountains had 124 percent snowpack last winter and summer rain showers have been plentiful, most of that moisture was diverted to filling reservoirs and groundwater reserves before reaching the Great Salt Lake, according to Davis. "There's a lag time there. It's got to kind of fill up the bank account before it starts lending itself to the lake, " he said. But every bit of moisture helps, Shearer said. "The fact that we've gotten very heavy rainfall over the last month-and-a-half has mitigated some of the damage, along with the cooler temperatures, " he said. "It's slowed down evaporation." Andrew Rupke, an industrial minerals specialist with the Utah Geological Survey, says receding shorelines aren't always a bad thing, especially for companies that use evaporation in harvesting minerals from the lake. "Ultimately, as the lake recedes, it will concentrate the minerals. That's a good thing, " Rupke said. "Basically, they'll need less water to get the same amount of product." 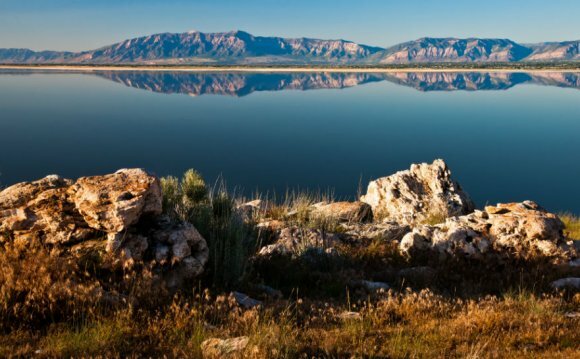 But overall, the implications of drastic reductions in water levels don't bode well for those who depend on the lake's resources, according to Justin Dolling, northern regional supervisor for the Utah Division of Wildlife Resources. "Obviously, if the lake were to go dry, that would be a significant impact, " Dolling said. "Not only to wildlife, but to the industries that operate on the lake — the industries that mine salt and different elements used in fertilizers, and of course, the brine shrimp industry." While the Great Salt Lake Marina operates comfortably on a slim budget, more of the larger boats are having to be extricated from the shallow waters before their hulls reach the ground, Shearer said. "The deeper draft boats are stuck in here and are basically cabins on the water at this point, " he said. "But it's not like recreation has stopped here at Great Salt Lake. A lot of the sailboats can still get out." Other forms of recreation indirectly depend on the lake. Storms that generate on the lake pick up moisture and drop it in the mountains, producing "light, fluffy powder" for ski slopes, Dolling said. Lower water levels on the lake could mean less snow pack. Shearer calls the lake "a recycler of water." "It puts water back up in the mountains during the winter, and during the summer, that water comes back down here, " he said. As the shoreline recedes, more of the fine-sediment soil beneath is exposed to the wind, causing dust storms and contributing to hazy conditions. "There's some air quality issues that come with lower lake elevations that are beyond anybody's control, " Dolling said. "It's just another issue, and if the lake were to ever go dry, that would be very unfortunate." In the northwest corner of the Great Salt Lake, Gunnison Island contains the fourth-largest pelican rookery, or breeding colony, in the U.S., according to Dolling. Gunnison Island and others that shelter ground nesters from predators are becoming more at risk with every foot that water levels go down, Dolling said. "Under really low water conditions, (Gunnison Island) could become a peninsula to the mainland, and that would allow for predators to enter the island and disrupt that colony, " Dolling said. The water elevation at which the island would connect to the mainland is unclear and may be far off. But such has already occurred for Antelope Island, where pronghorn antelope, mule deer and bison have left and established populations elsewhere, according to Dolling. "Currently, it's not posing much of a problem, " he said. "But if it were to really start to grow and expand, we might see increased wildlife-vehicle collisions on I-80. It's an area that's primarily private land, so it would be tough to get hunters in to help control the population." The lake could become less of a haven for migratory waterfowl, like ducks, geese and swans, as they travel along the Pacific Flyway.